Grandmaster Jiang Jing Sung Baek has 49 years of training, and 40 years of teaching experience He has taught Kuo Shu as a Daoist spiritual discipline in Seoul and Cheonju, Korea, between 1970 and 1978, in Chicago, New York, Los Angeles, San Fransisco, Phoenix, Denver, and Burlington, from 1978 to 2007. He has been a technical and spiritual teacher for over 100 schools. Grandmaster Sung Baek has conducted over 300 Kuo Shu camp training sessions, primarily in Chicago, Vermont, and Seattle between 1978 and 2007, teaching longevity and spirituality in Kuo Shu and Qi Gong. 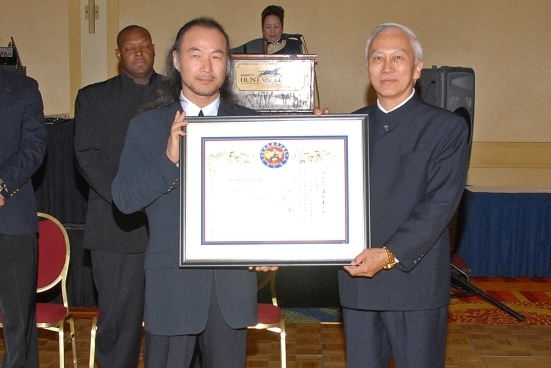 In 1995, Grandmaster Sung Baek gave up his own Sung’s International Martial Art Tournaments, which had been around for 10 years, to demonstrate the international brotherhood of Kuo Shu through sponsoring the USKSF.